High representative of the European Union Federica Mogherini, Vice-President of the European Commission and host of this joyous celebration, thank you for welcoming us in this house. It is a great honour to be here with you today. 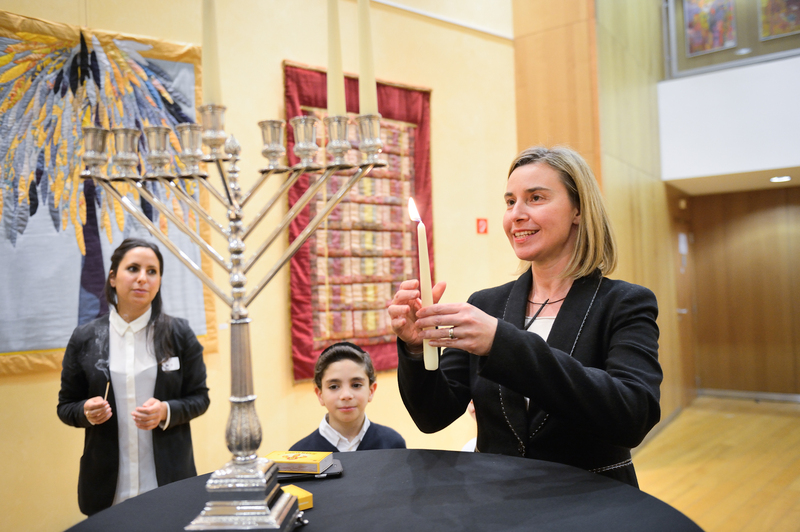 and it is a great honour for the Jewish community in Europe to have a Chanukah celebration here in this living monument to peace which is the European Union with you High Representative Mogherini. Chanukah in Jewish culture has become the symbol of freedom. It is the most awaited day for children as all the family seat together warmly around the candles, and, yes, they also get beautiful presents. But Chanukah its not new in Europe. Allow me to mention here some points of its history, in order to know where we are heading we must understand where we come from. Chanukah was celebrated in times of joy and in times of persecution, kindling this humble but bright candles around Europe for 2 millennia, always making sure that the flame of hope is never extinguished. There is a well recorded presence of Jews throughout ancient Greece and the Roman Empire as early as 3 centuries before the common era. Strabo, Philo, Seneca, Cicero, and Josephus all bore witness to that, by mentioning Jewish populations in the cities of the Mediterranean Basin from the Iberian Peninsula to the shores of Greece and Turkey. In the beginning of the reign of Caesar Augustus, 27 BC, there were over 7,000 Jews in Rome. The Jewish historian Josephus confirms that, as early as the year 90 of the common era, there was already a Jewish diaspora living in Europe. There are numerous archeological findings dating from the 1st to the 7th century, that prove the presence of Jewish communities in remote corners of this continent. First century Jewish texts, show that In the beginning, this festival was celebrated outside. But fear of persecution forced the lights to be hidden. During the inquisition for instance, Spanish Jews literally lit these candles, in the closet. And this strange tradition is still the way many families from Spanish origins celebrate chanukah to this day. But a united Europe marked a new milestone in the history of humanity. Before then, people believed that one united entity had, inevitably to be made of a homogeneous culture and of one language and one religion, with no place for cultural diversity. Today we understand that the homogeneity needed to make a strong union is our common humanity and shared values, regardless of the language in which this values are expressed or the way each of them celebrates special moments with special foods. Culture, is the expression of a collective memory. When we recognize, and listen to the experiences and memories of others we are validating them as human experiences. Although different from our own memories, we may empathize with them, learn from each other and mutually enrich our understanding. Chanukah has been celebrated in Europe for about 2000 years. We can safely say that Chanukah is also a European festival, fostering common values of freedom and tolerance. For that reason we choose to call this celebration Euro Chanukah. Because we are proud to be part of, and wish to accompany the European Project. The EJCC believes that a strong EU is one of the best ways to promote the wellbeing of the Jewish community and all other communities in Europe. therefore we should all feel equally responsible to nourish it, show democratic support and take on board critical views. Therefore this celebration today, is especially important and we thank you Ms . Mogherini and the members of your cabinet, for making this happen. Even when flooded with invitations and requests from presidents and organizations from around the world after recently taking office , you have found time for this! and we warmly thank you for it. I wish you much success in your work, may your light, reach far and beyond, to bring true peace in the world. Your success is our success. As the holiday season is fast approaching i wish you all Joyous Holidays and Happy Chanukah.